Since 1999 Gift Home Mart/ GHMconnect has been providing online wholesale merchandise solutions to independent specialty retailers. From the inception, we have looked at building and operating our business through the eyes of independent retailers. 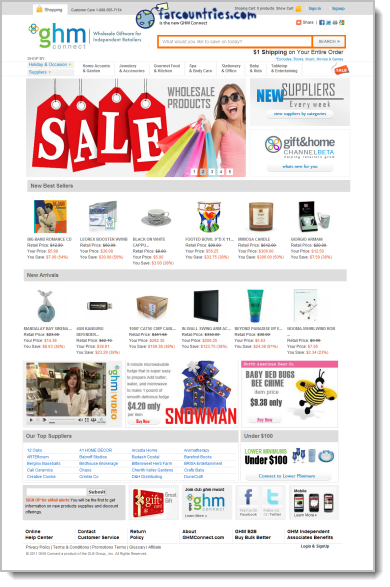 GHMconnect.com provides the independent gift shop and home accent retailer with a one-stop wholesale buying experience. By offering practical, value driving merchandise solutions, name brand and truly unique merchandise, we help independent retailers drive sales, increase margin, and make their stores stand out from the competition. Our goal at GHMconnect is to fully leverage technology to provide independent retailers with the day-in and day-out capabilities to offer the Right Merchandise, at the Right Time, at the Right Value. Connecting independent retailers to sales driving, margin enhancing, 24/7 merchandising solutions. 1. Exclusive low order minimums. 2. Save $$$ when you order with online only discounts. 3. Customize your order your way: easy, convenient, 1 invoice wholesale shopping. 4. Fast delivery, enabling inventory management relief. 5. Responsive, friendly, customer service. 6. Brand name and unique wholesale merchandise selection. 7. Save your favorites for instant reordering. 8. GHMC Points: Additional discounts based on your sales volume history. 9. Safe technology for online ordering. 10. It’s fast and easy to navigate.